There is no harder job in the world than being a Mother yet nothing is more rewarding. There are no manuals or how to's as to being the best parent out there. And even though there are rules (ahem law's) as to what not to do, there is nothing set in stone telling you how life is going to be after a child enters yours. I was thrilled to get the opportunity to read one of the newest book's by Chicken Soup called, "Chicken Soup for the Soul: Thanks to My Mom". I am definitely not a perfect Mother but I try. Our lifestyle is organized (my OCD) but messy, planned out and scheduled but always running 5 minutes behind, and always always always on the go with no sleep involved for any of the five of us!! I have tons of epic fails but I try constantly to be the best Mom I can in such a chaotic world. I try to constantly laugh at myself for the mistakes I make and in turn learn from them. It shows the kids that it's ok and that we move on easily. Chicken Soup for the Soul: Thanks to My Mom has "101 stories of gratitude, love and lessons that will make every mother smile, laugh out loud and even tear up a few times. 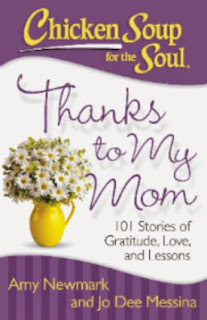 This book is a HUGE thank you to our mothers that contains heartwarming and entertaining anecdotes that will make her feel loved and appreciated!" Recommendation: Definitely an entertaining read especially if you only have a few moments a day to read a few pages. I think the cost is in line with any other books of this type and this was worth the read for sure! I plan on sending this over to my Mother after I've finished reading it. Definitely the perfect gift this Mother's Day. Giveaway: Chicken Soup for the Soul is going to give one of A Lucky Ladybug's lucky readers a copy of Chicken Soup for the Soul: Thanks to My Mom of their own! I drove myself and a eighty year old woman whom I clean her apartment for out to breakfast on Mother's Day. I celebrated by getting KFC and a Dairy Queen cake. Didn't celebrate it as I am not a mom and my mom has been deceased for 10 years. It was just another Sunday for me. I celebrated Mother's Day at home this year. I called my mother, and my daughter Skyped with me. Thanks for the giveaway!